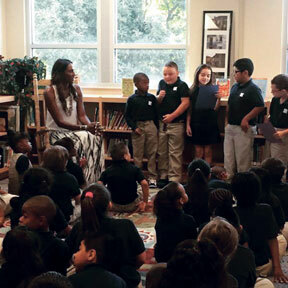 Recently, WNBA legend, four-time Olympic gold medal winner and Champion for Choice, Lisa Leslie, toured two Indianapolis schools to highlight the quality options that are available to parents and students through educational choice. Leslie was also accompanied by AFC executive counsel Kevin P. Chavous and community leaders during her visits. Leslie first stopped at Christel House Academy West, a public charter school, where she visited with 2nd grade students and discussed the importance of maintaining a focus on learning and being yourself. “Believe you’re special and you can do anything,” said Leslie while she sat with students and discussed her experiences at school and playing basketball. Then the tour stopped at Providence Cristo Rey to discuss the school’s innovative learning techniques and unique model. Leslie also spoke with students and gave them advice on how to achieve their goals in high school and beyond. The school has a Corporate Work Study program where once a week students work for the day at organizations the school has partnered with to gain experience and earn academic credit. All of the students at the school come from low-income families and the school has a 100 percent college acceptance rate. After the school tours, Lisa Leslie will speak at a luncheon at the Indianapolis Urban League.